The music of a Disney animated film can make it something that stretches generations. The ballads, the title track, the sidekick song, all of them can find their way into the heart of the watcher and give that film a very specific memory. Even more so, a great villain or hero song can define the entire film overall. Through the years there have been numerous villain and hero songs that have become staples of the Disney brand, but which is our favorite? That last bit is very important. "Our favorite". Not the "best", or even "your" favorite, but ours. To everyone who fills out the bracket below, you will most likely have a vastly different outcome and that is what makes it so great. Each person is effected by every song in their own particular way. 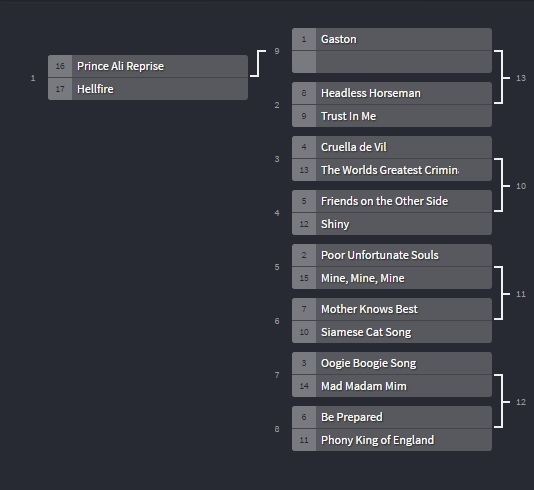 So, after you listen to us deliberate through the bracket, share your personal results with us! Which songs made it to your finale and which wound up on top of the mountain? Lot's to do! Let's go! It's showtime!